For measurable reduction in both Footstep and Airborne noise we have to make a fundamental change in the way floors and ceilings interact. The problem is that everything is screwed together; no matter how many layers there are, no matter what kind of high priced insulation is used, it is all still screwed together. 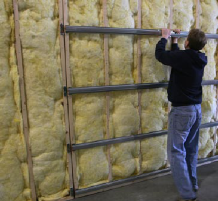 If you're an architect or a home builder looking for an effective way to soundproof a room, look no further. Green Glue Noiseproofing Clips allow you to mechanically separate drywall from the wall's frame so that when sound hits the wall most of the sound does not transmit through to the other side. Noiseproofing Clips can significantly reduce sound from voices, TVs, and radios from traveling through walls. When used in ceiling/floor installations, it works to reduce the sound of footsteps to the level below. Width: 1 - 1/4 in. Height: 4 - 1/4 in. Measure for placement of Green Glue Noiseproofing Clips using layout guidelines listed in the Installation Notes. Mark locations and install clips using appropriate screws. Snap appropriate hat channel into clips. Place shims on the floor to allow spacing between the drywall and the flooring. This ensures decoupling from the floor to make it impossible for vibrations to travel from wall to floor and vice-verse. Use acoustical sealant to fill the gaps around the perimeter, and all gaps around electrical boxes, windows, and doors. • Clips are spaced no further than 48 inches apart along the length of the channel. • Clips along the perimeter must be less than 3 inches from the end joists. Measure for placement of Green Glue Noiseproofing Clips using layout guidelines listed in the Installation Notes above. Snap 20 gauge hat channel into clips. Many ceilings will require you to overlap hat channel. Instructions for doing so are as follows: Overlap 6 inches of hat channel between two clips.